special nutrients - Hortiland Holland B.V.
WINTERMIX 6-LS is a liquid solution of humic and fulvic acids 7,5% and 1% aminoacids. Besides, it contains 6% N, consisting of pure UREA without biurets. WINTERMIX 6-LS provides the plant with an effective nutrient to overcome problems which occur during Winterwhen soil temperatures drop and whenever the plant is attacked by diseases. When the temperatures are low, WINTERMIX-6 LS facilitates the absorption of nutrients and enhances root development. Regular applications of WINTERMIX-6 LS increases the percentage of organic matter in the soil, resulting in a stronger rootsystem. WINTERMIX-6 LS is also succesfully applied in openfield crops, in order to strengthen the rootsystem against soil diseases. 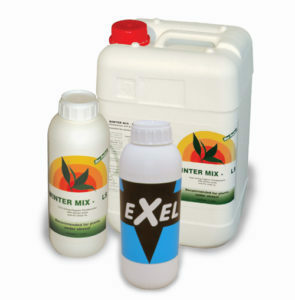 WINTERMIX-6 LS when applied with plant protection products improves their effectivity. EXEL 10% L.S. is a highly concentrated liquid nutrient consisting of humic and fulvic acids, combined with other organic components and enriched with 1% natural amino acids. EXEL 10% L.S. is mainly applied as slow release organic fertiliser in vegetable crops. it is especially effective in poor soils with a low organic matter content. The humic acids in EXEL-10 increase the water and nutrient retention of the soil, thus developing root growth and resistance of the roots against soil born diseases. EXEL-10 multiplies the activity of the microorganisms in the soil. EXEL-10 improves the availability of blocked nutrients in the soil. NOTE: seeds with a hard skin soaked in a solution of EXEL-10 will germinate better and faster. VITAFREE 25% is a special watersoluble powder which contains high quality sea weed (Ascophyllum Nodosum). VITAFREE 25% supports the plant’s root system by unblocking plant nutrients fixed in the soil (due to high ph, low temperatures, etc). Αpplications with vitafree considerably improves the colour, the taste and the size of the fruits. *Contents and formulations may vary according to restrictions and regulations per country.